I stumbled into Syria a decade ago. I was exhausted and sick, desperate for help. I had been traveling for weeks—essentially making the reverse sojourn of so many recent refugees. My trek began in Rome, and almost 1,500 miles later—by foot, boat, train, a short flight over a war-torn area, bus, and taxi—I made it to the border of Syria. Of all the countries on my journey, my friends and family had been most concerned about my visit to Syria. And, I have to admit, I had been a little nervous myself. My main worry had been that I would be singled out because one of my tattoos is written in Hebrew. I had planned to black it out with a Sharpie right before I crossed the border. Seriously, I’d carried a Sharpie all those miles to conduct this less than covert cover-up job. But when I reached the border the absurdity of my plan became clear…and I realized that, even if there had been a tattoo inspection, I was too tired to care. The border guard simply smiled at me through the taxi window, and I went back to focusing on my navel. Okay, it was my whole belly that captured my attention. I had acquired a pesky amoeba in Turkey, though I had yet to figure that out. All I knew was that my belly felt like a bag full of water and almost-dead goldfish in the hands of a toddler. Slosh. Panic. Slosh. I had set off on this journey, not as a refugee, but as a pilgrim. I traveled all those miles with one intention: to ask strangers throughout the Balkans and the Middle East how they would describe God. I was especially curious how people living in lands cracked open by conflict viewed God…and how I might gain a greater vision of the divine through their insights. People had not only responded to my question, they had also shared their life stories, given me gifts, and invited me into their homes. But by the time I reached Aleppo, my thoughtful question descended into a desperate quest. I began to ask strangers on the street for the cure to my stomach ailment. Everyone seemed willing to take up my cause, but they all had different solutions. While stuffing food into my goldfish-graveyard-of-a-stomach seemed like the least helpful answer, once I met Mustafa I couldn’t resist. Mustafa owned a falafel stand near where I was staying. People waited in line day and night for his falafels, but curiously enough, everyone seemed ridiculously happy to stand in his line. I wanted to be ridiculously happy, too, even though just the thought of eating was nauseating. I joined the blissful masses in line, but when I went to pay, the old man in charge of payment asked my two friends and me where we were from. When I said, “America,” a commotion broke out. Mustafa approached. He insisted our falafels were on the house. Then he took us on a behind-the-scenes tour of his falafel stand, where we got to see his refrigeration system and taste the condiments. Afterward we had a lovely chat about family and culture. Mustafa explained that though he didn’t always agree with our president and our policies, he loved Americans. Nonetheless, I returned to Mustafa’s stand with all its ridiculously happy people. This time I was determined to order more food (which I had no plans of eating) and leave a big tip to repay him for his kindness. Again, Mustafa insisted I not pay a dime. On day three I waddled over to Mustafa to simply say hello. When I arrived he suddenly seemed distracted. I began to wonder if I had offended him or overreached in my hopes of friendship. But soon enough he returned and said he had arranged a surprise. 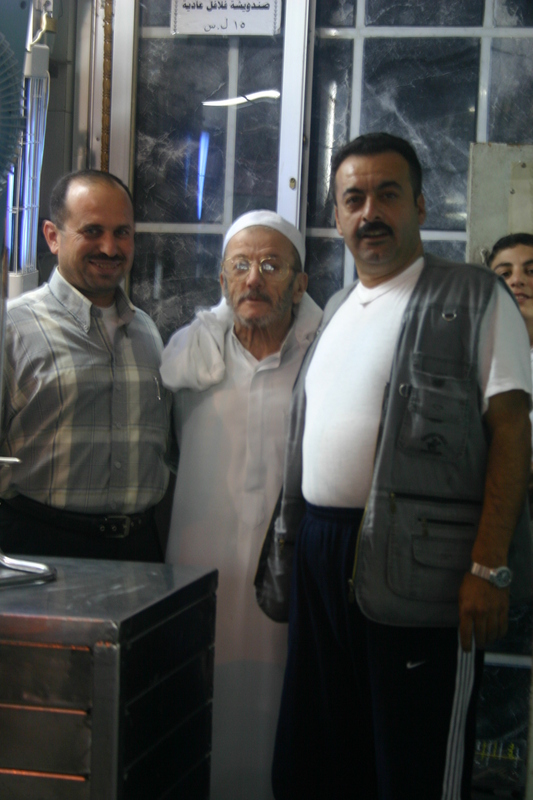 He paid for a taxi to take my friends and me across town to see where and how the falafels were made. Mustafa wasn’t able to cure my gastrointestinal situation. But his extravagant hospitality invited me to hope I’d eventually get the help I needed. For the next few days I tried more treatments, I was prayed for by a nun in convent in Saidnaya, and then I happened upon a pharmacy attached to another convent in ancient Maaloula. There I found the right medicine. Twenty-four hours later I said good riddance to the amoeba. Shortly after that, I left for Lebanon. I only experienced Syria as a haggard invalid. I didn’t have the energy to ask Syrians about their descriptions of God. However, my understanding of God grew stronger while I was there. I had so little to offer, but I was shown a wealth of kindness. I was reminded of the long legacy of hospitality tied to my faith. In fact, Aleppo’s name harkens back to it. In Arabic it is Halab, meaning “gave out milk.” One explanation for the name is the ancient tradition that Abraham gave milk to travelers as they trekked through the region. Throughout the Hebrew Scriptures, the faithful are told to care for strangers. And then in the Gospels, Jesus says that when you welcome those considered the least among you, you welcome God himself. When you’re traveling, tired, and sick, you can feel at your most vulnerable. And when someone offers you kindness, you get a glimpse of the generosity of God in ways you wouldn’t otherwise. Through the Syrians, I got to gaze at a God who showed me grace…grace that I neither deserved nor could repay. So much has changed since I visited Syria. Now Aleppo has been razed by war; it’s been reported the Assad regime even used chemical weapons there. I don’t know if Mustafa is still alive and if he and his family are among the refugees. 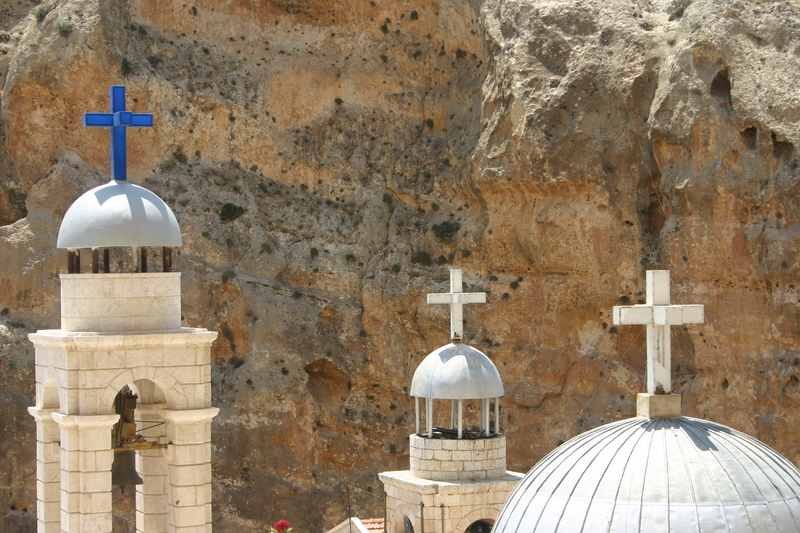 I don’t know if the nun who prayed for me in Saidnaya and the pharmacist who helped me in Maaloula are living either. Those ancient cities have been targets of ISIS. I pray they have all miraculously survived. I’d love to one day show them a bit of the hospitality they extended to me. 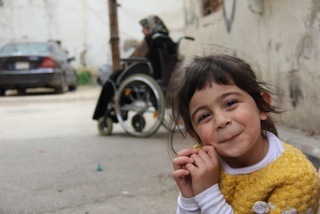 I did get to spend some time with Syrian refugees in Beirut this spring. While their needs were great, something more powerful emerged: their kindness. Refugee after refugee entrusted me with their stories. I interviewed one mother from Aleppo–I’ll call her Maya–who had given birth when the city was being hit by chemical weapons. She was sent home from the hospital out of concern that the injured would put her baby at risk. Then only a short time later a bomb went off near her house. Despite the horrors she experienced, she shared with me about her newfound relationship with Jesus and her own discovery of a God of grace. She now volunteers at a community center in Beirut and is helping other refugees, even as her and her family are dealing with being displaced. 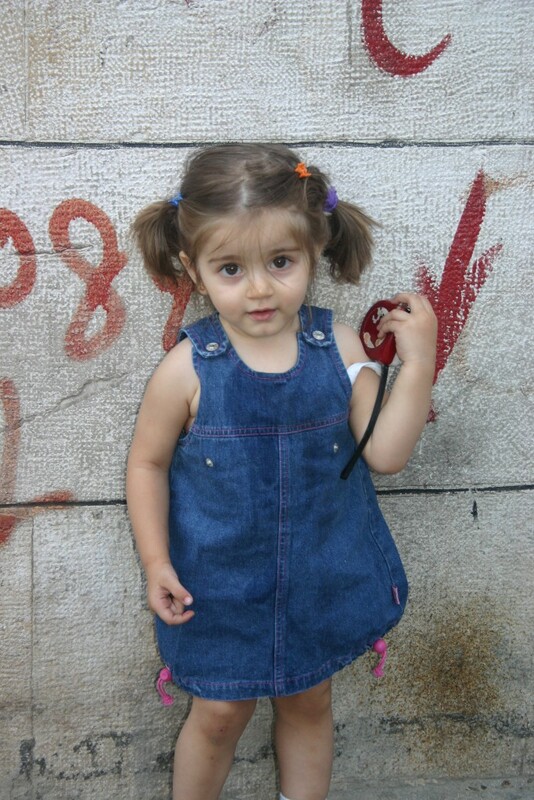 Delightful Syrian refugee girl I met in Beirut. My life is richer because of the Syrians I’ve met. My view of God is bigger too because of them. I hope we as Americans can respond in a similar manner as Mustafa did with me. While he didn’t agree with all the approaches of our leaders and our policies, he embraced us as a people. I am heartbroken by the cruelty of the Assad regime, and gut-wrenched over the tactics of ISIS, but the Syrians have suffered. They know what it’s like to be weary from being on the move, sick and fatigued in ways I could never fathom. And for those of us who call ourselves Christians, may we be like the nun who prayed for me–who advocated on my behalf asking a powerful and loving God to intervene for me. And may we too be like the pharmacist who was so thrilled to provide me with practical help to address my need. And may we be like Maya who in the midst of her own losses is helping others. Now is our opportunity to show a bit of hospitality to Syrians, and in doing so welcome God. And I can’t help but believe we will be enriched even more.